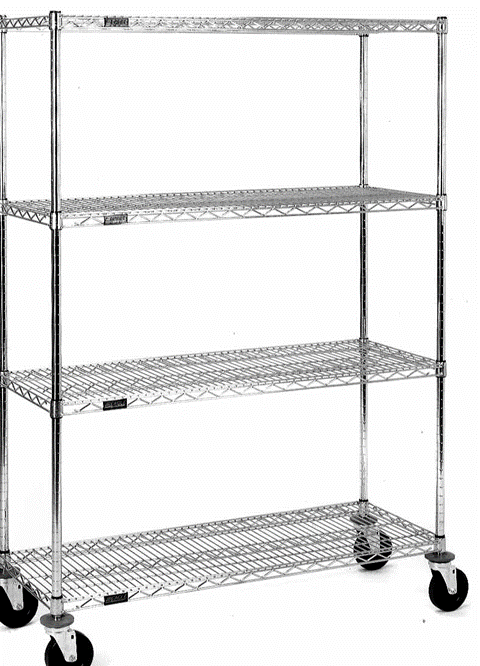 JHA Techspace provides some of the industry’s most advantageous pricing for high-quality open wire shelving units and other (link to carts) ‘wire’ products. And – many of our shelving units are ‘Quick Ship’, delivering to our customers in 3-5 days. The JHA Techspace Price-Quality-Delivery Advantage. Contact us for details. Optional casters add 4″-5″ to overall height. 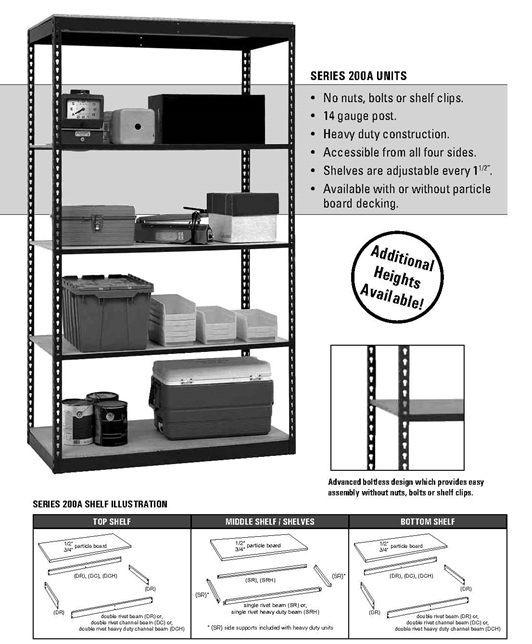 Users may include as many shelves per unit as post height and overall weight load allows. Two is minimum. Four or five are typical. ‘Starter’ (free-standing) shelf units consist of 4 posts with adjustable feet. Each shelf comes with 4 mount clips. ‘Add-on’ units unit consists of 2 posts, with adjustable feet, and (2) shelf hooks per shelf. All units have a 500 lb. or greater weight load – per shelf. *Note: The vast majority of our customers specify standard chrome or stainless steel. But, for environments with bio contaminants or excessive moisture exposure, we offer anti-microbial epoxy and zinc coating options. 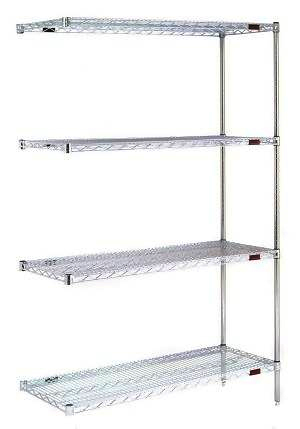 Why Specify Wire Rack Shelving? Wire NSF approved shelving reduces dust build-up, allows free light and air circulation, increases sprinkler effectiveness and improves visibility. 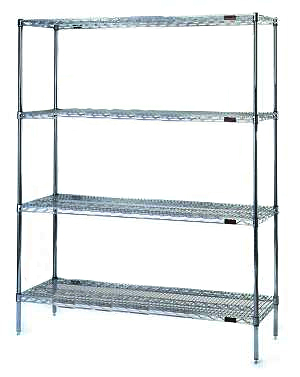 Our wire shelving is fast and easy to assemble with no tools required. 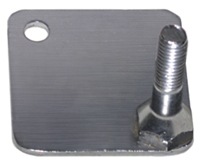 Each wire shelf is adjustable in 1″ increments. Our posts include leg levelers, when casters or footplates are not used. JHA Techspace provides some of the industry’s most advantageous pricing for boltless storage shelving. Most of our standard sized systems are ‘Quick Ship’ and deliver to our customer’s locations in 3-5 days. The JHA Techspace Price-Quality-Delivery Advantage. will be rated at 300 lbs. and a 60” will handle 150 lbs. Note: Ratings based on even weight distributions. Boltless shelving consists of heavy duty vertical steel ‘L’ channel uprights, joined by horizontal shelf supports. Their thick steel end rivets drop into the inverted teardrop slots. Shelving units ship K.D (knocked down) and must be assembled on site. Only mallet(s) and ladder(s) are required. Color: Gray. Optional beige may be available on volume orders. 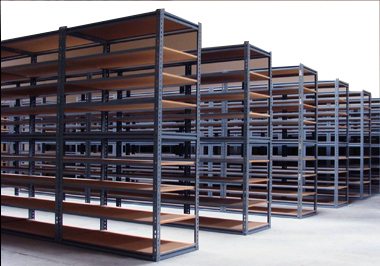 Users may include as many shelves per unit as upright height and overall weight load allows. Three is minimum. Four or five are typical. If you know your weight loads, sizes and dimensions, let us know. If there are questions, we will welcome the opportunity to review the specifics of your industrial shelving needs and objectives. Either way, we’ll quickly provide a quote for the best – and most cost-effective boltless shelving system(s) for the application, taking into account what is being stored, sizes, weights, schedule, and budget.